The Bernard Bunch - The 'Secret' Diary of Abigail Bernard A blog about the life and times of a littleFrench-English girl growing up in a French village at the foot of the Alps. Despite her disabilities caused by unlucky genetics, Abigail is a stylish, classy little Princess, who engagingly describes the joys of growing up with her two boystrous brothers and many friends and family members (with the help of co-author "Mama"). 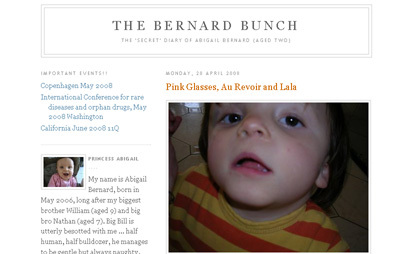 Created initially to enable family members scattered across the globe to keep tabs on the delicate health of this little girl, the blog has become a real point of reference for Abigail's family amd also for parents of children with similar disorders (Jacobsens Syndrome, West Syndrome, Paris-Trousseau blood disorder). Top 10 Best Good Morning Sayings To Make Your Day loving, romantic, cheerful, lovely with pictures for an awesome day. 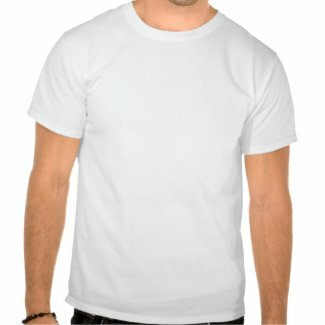 Anonyblog that stresses positivity, gratitude, compassion, and humor in the course of an ordinary yet colorful life...and the occasional rant. Product Reviews, giveaway, sugar free recipes for anything you can crave. Comfort food, pantry cooking, crafts for kids, family activities, educational activities and lots of FUN! Collection of baby gift ideas, baby shower gift ideas, gift ideas for baby, new baby gift ideas, unique baby gift ideas, baby gift basket ideas, and baby girl gift ideas. / Adventures on a 100 acre rural Georgia Farm.Stories,recipes, Photos of animals, farm life and unique projects like building a waterwheel and sawmilling. Clean air and country living. ; I blog about my family and all the craziness that comes with being a mom. I also talk about my search for happiness in a bitter world. My Baby First Year blog give new parent All Information about your newborn baby. How to care your first year baby in the First curious and important Year.This is Free Parenting tip for you. Life is not perfect, and neither am I. I wat to "get real" and talk about all the issues we know we deal with! And add in some silliness to help me get through the day! I am a wife, mother and step-mother. And I have lots to say and my husband is sick of hearing it. or Blogging Girls...I had a mind once. Now I have small children. Views on anything and everything, including, but not limited to, America, the World, Politics, the News and the Media . . .With a little bit thrown in here and there about me & my family. This blog is a web resource for My Mommy's Place.com detailing the Mommy adventures of the site founder. Tips, Requests, Articles, Recipes, and assorted misc. to the older, wiser, livilier, better woman. Want less stress or more...work at home or climb the corporate ladder? Smarter or stupider? In today's families wireless internet has become a neccessity with wireless routers etc... The wireless internet increases the amount of wireless security issues. To tackle such problems, an effective tech-wise plan will serve well. Web Hosting from a good company can also help in protecting data flow. Domain Registration is getting cheaper from many web hosting firms. An apollohosting company offers everything from ecommerce services to dedicated servers with least complaints. MCSE exam 70-270 provides some of the basics of windows installation and troubleshooting.